1. What is Spinal Decompression and how does it work? Spinal Decompression is a sophisticated form of computerized traction. Spinal Decompression Therapy produces a negative gravity at the disc level. A negative gravity causes a kind of suction or vacuum effect of the disc material causing disc material that may be protruded outward to be pulled or sucked in away from the nerve. With some of the more advanced systems patients are strapped onto a table facing upward or downward. These advanced systems also allow the therapist or Doctor to decompress the disc using 54 different table positions maximizing the chances of the disc material returning to a normal position. 2. Who will benefit from Spinal Decompression? Spinal Decompression Therapy is designed for the rehabilitation of the spinal disc. Patients with the following diagnosis and/or symptoms may be candidates for the Spinal Decompression Therapy. 3. Are there any contraindications or side effects with Decompression Therapy? Patients with fused low backs or who have metal screws or plates in their spines should not have Spinal Decompression Therapy. Extreme caution should be used with patients with advanced osteoporosis. Patients receiving Spinal Decompression Therapy may experience some discomfort in their back area following the Therapy. This may last up to 24 hours. This is a normal part of Spinal Decompression Therapy. 4. How many Spinal Decompression sessions are needed? The recommended program for disc rehabilitation can vary from patient to patient, depending on the severity of the disc problem. Most patients begin to experience relief within the first five sessions. After the fifth Decompression visit Patient treatment is reevaluated to determine how many, if any, Decompressions are necessary. Candidates for Spinal Decompression Therapy are first given the opportunity to experience the minimal constraints of the procedure prior to making any decision to starting the procedure. It is recommended that patients with chronic conditions such as Degenerative Disc Disease and/or Spinal Stenosis stay on a maintenance Decompression program of once a week to once a month depending on the severity. 5. 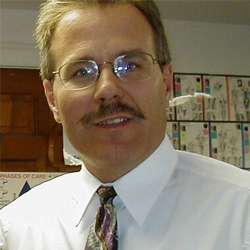 Is Spinal Decompression Therapy all the care that is needed? As stated above, Spinal Decompression rehabilitates the disc itself which produces fast results for back and leg pain sufferers. However, pre and post therapy such as stretching and core strengthening is necessary to stabilize and achieve maximum and lasting results. 6. Are there different types of Spinal Decompression Systems? Yes, there are many different types of Spinal Decompression Systems. All successfully create a negative gravity at the disc level. The most well known is the DRX9000. However, with some of the newer and more sophisticated tables, patients can now be treated facing upward or downward while incorporating 54 table positions. In addition, the 3D Active Track used here in our office, is one of the few systems that will allow the Doctor or therapist to be interactive during the Decompression Therapy. These newer advancements have increased the probability of success with some of our more challenging patients. Many people develop a herniated or bulging disc in their spine. Injury, aging, and poor lifestyle choices are common causes of a disc problem. While a mild degree of a “bulge” may be considered normal, there are a number of different types of disc injuries that are not normal and create a great deal of pain. In severe cases, muscle atrophy,pain and numbness can be present. When these problems exist, symptoms will show up in the lower back/legs, or arm and hand. Below, several common questions about disc problems are answered and discussed. In lay terms, a slipped disc can mean a ruptured disc or herniated disc. Although the term slipped disc is used, discs do not actually slip. Each intervertebral disc is sandwiched between two vertebrae supported by a system of very strong ligaments that help hold the spinal package together. Disc disorders are contained or non-contained. A bulging disc is an example of a contained disc disorder. A bulging disc has not broken open; the nucleus pulposus (the center section) remains contained within the anulus fibrosus (the outer layer). A bulging disc could be compared to a volcano prior to eruption and may be a precursor to herniation. The disc may protrude into the spinal canal without breaking open. The gel-like interior (nucleus pulposus) does not leak out. The disc remains intact except a small bubble pops out attached to the disc. A very simple example is a jelly doughnut. If you step on the doughnut with a lite amount of force, the jelly causes the dough to push, or “bulge” out; yet, the jelly does not leak outside the dough. A non-contained disc is one that has either partially or completely broken open; a herniated or ruptured disc. To illustrate imagine a tube (anulus fibrosus) of toothpaste (nucleus pulposus) placed under pressure. The pressure causes the toothpaste within the tube to move wherever it can. If any part of the tube is weak toothpaste may leak out. When a disc herniates the contents may spread out to the spinal cord and nerves. The disc material has very little space to go. Usually, the disc material enters into the area occupied by the spinal canal and nerve roots. When this occurs, a number of problems will be present, starting with moderate to severe pain. Using the example of the jelly doughnut again, in this case, when stepping on the doughnut, the jelly actually breaks through the outer dough and leaks out. When the disc bulges or herniates, material from the disc puts pressure onto the nerve root or spinal cord. This pressure, onto the nerve, is what causes the pain in either the arms or legs. To complicate matters, sometimes fragments from the anulus (tire-like outer disc wall) break away from the parent disc and drift into the spinal canal. These free fragments may travel into the spinal canal. This can be a more serious condition, such as Stenosis. 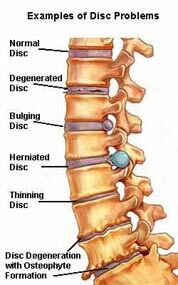 Depending on the type of injury and the condition of the discs, more than one disc may herniate, rupture, or bulge. Sometimes injury causes a combination of disc disorders. In an ideal situation, the problem may resolve in the first 60-90 days after the injury. However, when the problem persists over 90 days, the chance of it resolving on its own is slim. If an individual undergoes a number of injuries, or has abnormal wear and tear on a disc, it is possible to have degeneration. Degeneration of a disc is when the disc size and material, get thin and start to break down. When this occurs, the space between the two involved vertebrae gets smaller, closing down the foramen(hole) where the nerve root exits the spinal cord. This condition can cause a nerve to have pressure on it and create pain. Additionally, there tends to be changes to the bone that occur in these cases. These changes come in the form of bone spurs or osteophytes, which create their own set of problems. Some think that degeneration is normal with age, and to a degree this is true. However, when an individual has degeneration at one level or disc, and the rest are healthy, this is not normal. Generally this is caused from an injury, or series of injuries, in which permanent damage was done, or proper treatment was not done after the injury.